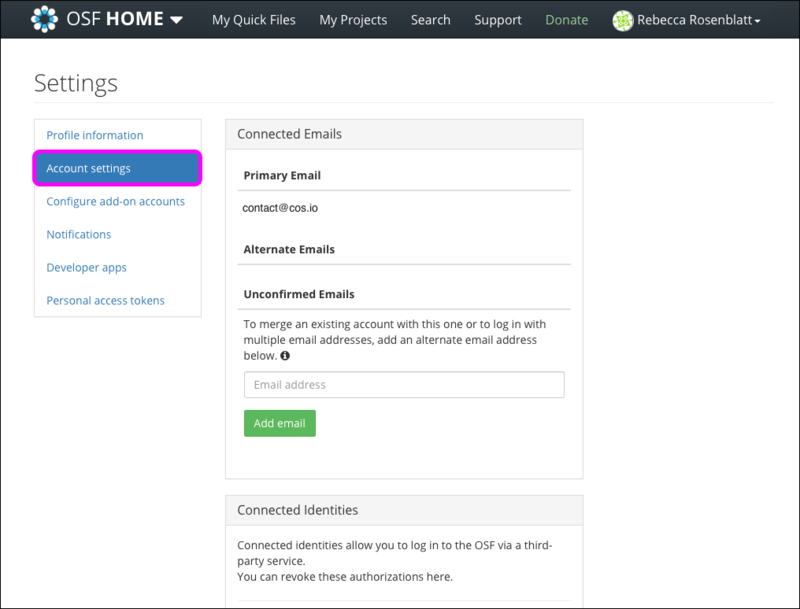 You can enable two-factor authentication for your OSF account to make your OSF sign-in process more secure. 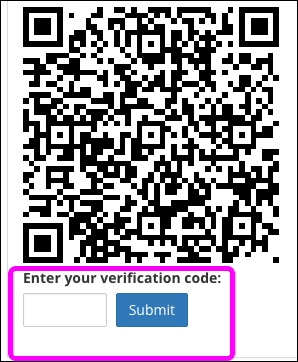 When you sign in to the OSF with two-factor authentication, you will need to enter a verification passcode from your mobile phone. 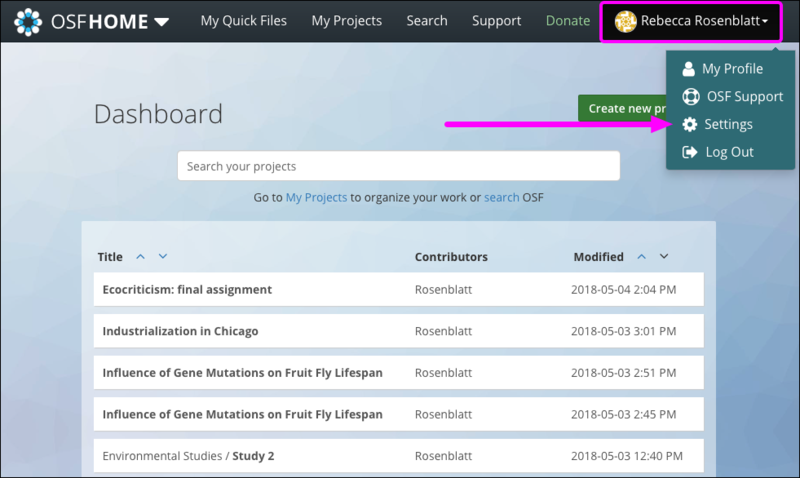 Sign in to the OSF, and your dashboard will appear. Click your name in the top right of the page, then click Settings from the drop-down menu. Click Account settings in the left sidebar. The "Account Settings" page will appear. Scroll down the page until you find the "Security Settings" section. Then, click Enable Two-Factor Authentication. A modal that explains important information about setting up your two-factor authentication will appear. Read this information, and then click the Enable button. Instructions on what to do next will appear in the "Security Settings" section. You will need to download a mobile app for two-factor authentication in order to receive the passcode to access your OSF account. Google Authenticator is a common app that you can use. After you have downloaded the two-factor authentication app on your phone, you can either scan the barcode image or you can enter the security key provided in your "Security Settings." 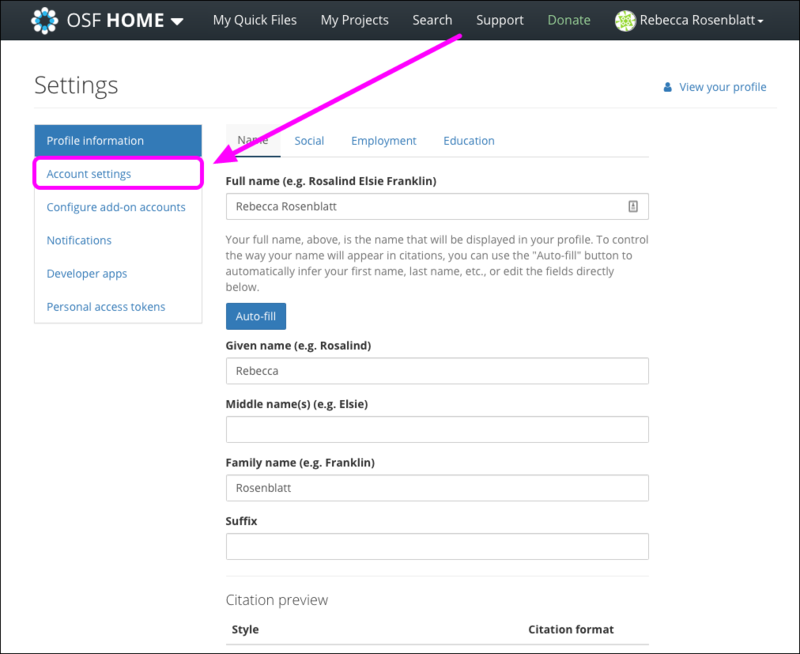 If you choose to enter the security key, your account name is OSF:[account_email], e.g. OSF:john@doe.com. To receive this passcode, open the authenticator app on your phone, and the passcode will automatically appear. Then, return to the "Security Settings" section on the OSF and enter that same passcode into the textbox below the barcode image. 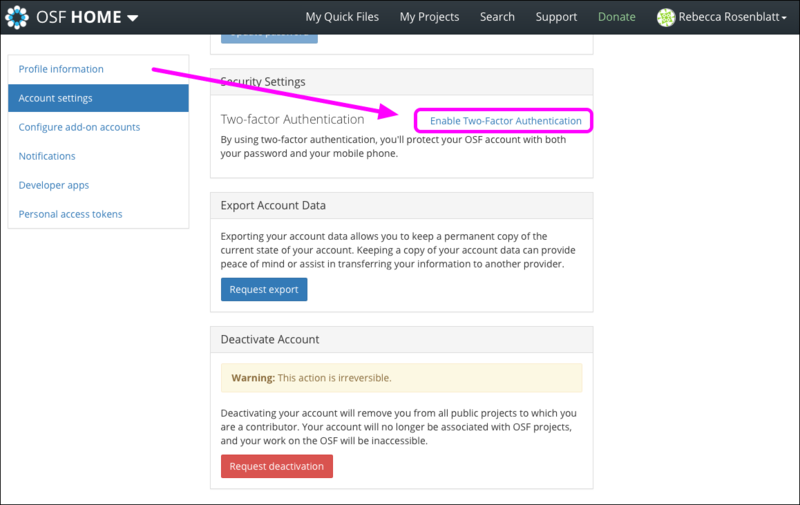 To finish setting up two-factor authentication for your OSF account, click Submit. When you have succesfully enabled two-factor authentication, your "Security Settings" section will show a red link that reads: "Disable Two-Factor Authentication." The next time you sign in to the OSF, you will be asked to enter your two-factor authentication passcode. 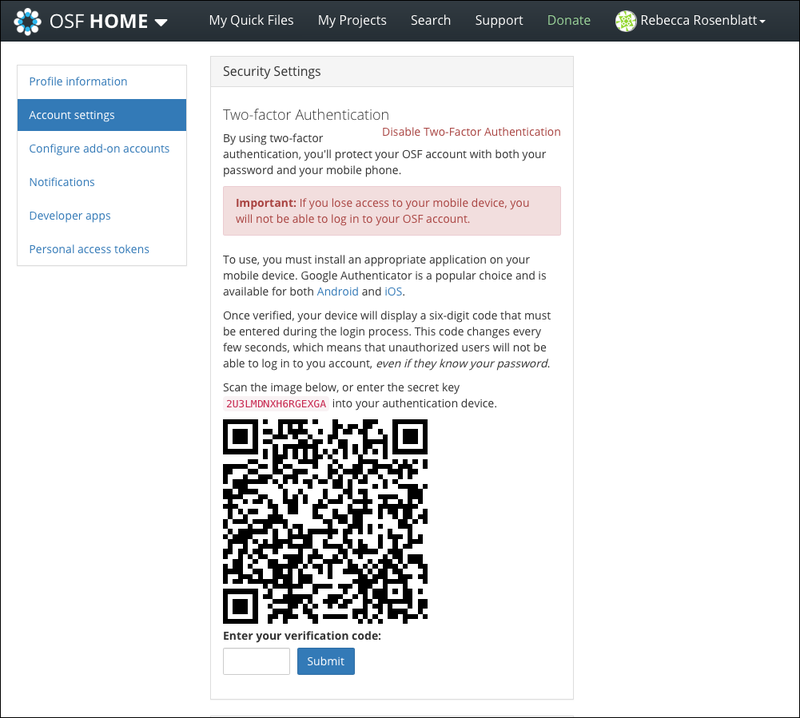 Open the two-factor authentication app on your mobile phone, then enter the passcode provided in the app into the textbox on the OSF. 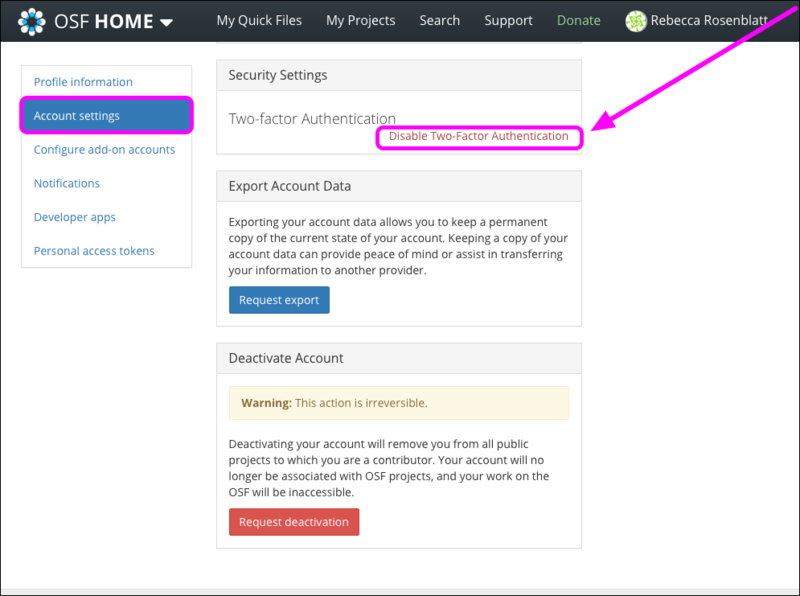 To disable two-factor authentication on your OSF account, go to your user "Settings" page as you did to enable two-factor authentication. Click Account settings in the left sidebar. The "Account Settings" page will appear. Then, click Disable Two-Factor Authentication. 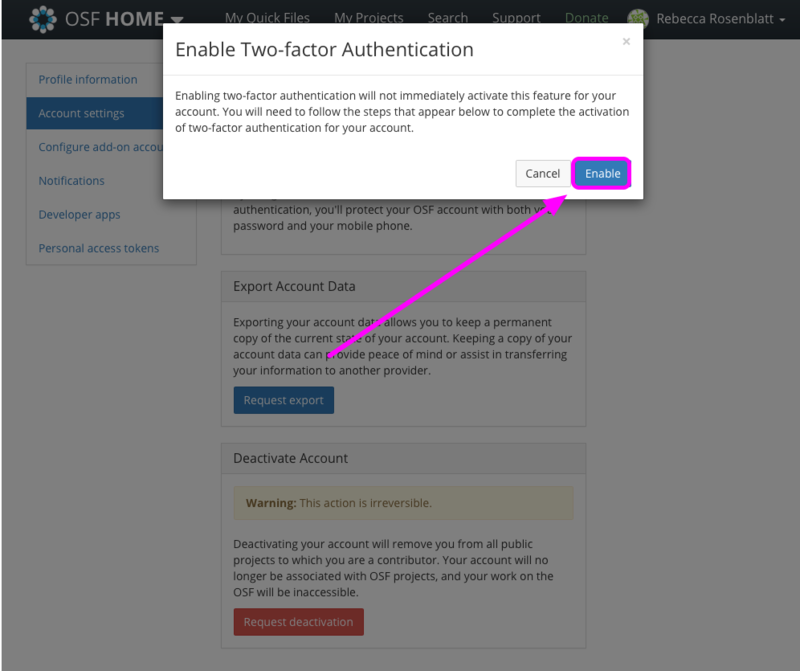 A modal will appear, asking you to confirm that you want to disable your two-factor authentication. Click Disable, and two-factor authentication will be removed from your account.